Come winter in Calcutta during my growing up days and we would make a beeline to the various 'expos' or exhibitions that would be held there. The Lexpo for leather, the textile expo, the big daddy of them all, The Calcutta Book Fair, and once during my college days, an international food fair organised by the students of IHM Kolkata. These exhibitions would be held at the Maidan back then and apart from the annual zoo visit, these outings were something that we would look forward to once the Durga and Kali pujas ended. When we were in school then my mother would take my brother and me to these. When in college, I'd go to them with college friends. These were popular dating hubs too in the Kolkata of the 90s from what I remember. I don't know if things are still the same. Two decades later, my mom still goes with my brother, sister in law and my baby niece to attend exhibitions in Delhi and Gurgaon. I don't got to exhibitions anymore. K and I are both cafe people now. On holidays we like to be the Sultans of Sloth and head to neighbourhood cafes and spend out time there. The idea of heading out to an exhibition on a holiday is not our thing. Not even food festivals in my case. The idea of going from stall to stall and eating food which might not always be the best around, usually in the heat, jostled by crowds, is not my idea of fun. That's just me of course. There are an increasing number of food festivals happening in Mumbai. The more talked about ones have the younger start ups and chefs offering their, often westernised, fare there. There are a fair number of regional ones which happen too and which are less talked about. The Koli Fish Festivals, for example, which are now fairly popular compared to when I first went to one. The CKP, Pathare Prabhu, East Indian ones and so on. Then there are the five star hotels which hold food festivals these days showcasing home chefs and their regional food. I must confess that I have given the most a wide berth. The idea of going to a Punjabi winter food festival in a five star to have the same old sarson ke saag and makkai roti or to a Bengali one to have alu posto, all of which I either make or have easy access to, doesn't excite me, nor does the idea of going to a food expo in South Mumbai to buy Shaan Masala and Ching's sauces which I can get at Roman, Benzer or Viajy Stores next door in any case. Yes, I am the Mr Scrooge of festivals. Well, this post is about an exhibition that I did go to yesterday and one that I strongly recommend that you go to. This is the Mahalaxmi Saras festival, which is being held at the MMRDA Exhibition Grounds at Mumbai's BKC this year and which is on till 29th January 2018. The exhibition is aimed to showcase produce from interior and rural Maharashtra from what I understand. The Maharashtra beyond Mumbai and Pune. And they have a huge food section too.! Which is possibly what draws food blogger, Sassy Fork, who visits the fair many times, each year. Yes, this is the 14th edition of the fair and Sassy tells me that it is better organised this time than before. Sassy Fork is the one who has introduced me to many of the Maharashtrian restaurants that I write about and has been trying to convince me to come to the Mahalaxmi Saras for years. She can be pretty persistent and at the end and I gave in and went this year and I am so happy that I did so! There are a couple of large sections with a gazillion food stalls at the Mahalaxmi Saras and these offers food from all over Maharashtra and no, this is not the usual pulled duck bao and bacon brownie and craft beer and beer cupcake sort of stuff which many of the more talked about food festivals in Mumbai offer. There are non-vegetarian dishes here that pack a serious chilli punch such as the Saoji mutton from Nagpur and the spicy mutton curries and liver masalas from Chandrapur close to Nagpur. I spotted Malvani style semolina coated mandeli fish and from the same stall had a most warm and comforting chicken curry and mutton curry with rice bhakras and then the Kadaknath chicken which had enough chilli oil in it to give a full bodied Sichuan pepper dish from Guangzhou an inferiority complex. I spotted soft shell crabs and robust masala coated fish fries and in the evening there was the promise of biryani from Usmanabad. While I spoke of the meaty stuff first, I have kept the best for the last. Yes, in this case I am actually talking of the vegetarian food! I did find it to be more nuanced than the non-vegetarian food that I sampled but that's also because my tolerance level for chilli heat is not too high and most of the non-vegetarian food that I had was packed with a solid chilli punch. Winter is the season of hurda in Maharashtra. What is know as ponkh in Gujarat. These are tender kernels of a a white millet called sorghum. A traditional winter favourite in these states which is gaining popularity of late with some modern restaurants such as The Bombay Canteen adding it to their menu and thereby joining the ranks of places such as Soam which have offered ponk in winters for a while. The Mahalxmi Saras allows you to taste hurda the way locals like it. I had an amazing hurda mix/ bhel where the green hurda grains were toasted on a flat tava and then sprinkled with a crunchy and lemony sev and shingdana (crushed peanut and red chilli) dry chutney and the combination was divine and represented everything of western chefs talk about, don't do too much to great produce. I had the hurda thali peeth made with a flour made with hurda and mixed grains. The version that I had was made with a moist dosa like batter and which tasted pretty much divine and was served with a green chilli thecha. What is a thecha? The Maharashtrian 'pesto' it seems. Anything pounded and served could be a thecha according to what I was told. Chillies figure in the plot usually. 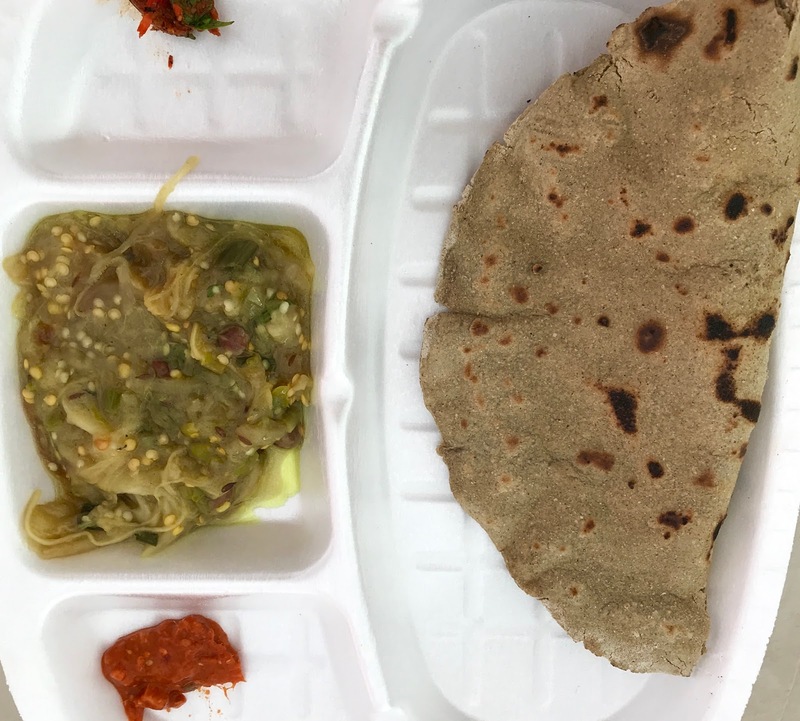 I later saw the tawa roasted, oil free and drier hurda thali peeth too at a stall whose owner claimed that this was the original one. The little mischievous boy in me almost told him, that while this is true, the fried one looks like more fun. Don't quote me on this. Then I had a misal. The Sangli version sold by an affable looking grandpa and grandma. The misal launched a hundred missiles in my mouth as this had a searing chilli heat kick. Our friend Archana explained that this is sort of misal that she likes. The more demure ones of the restaurants in Dadar such as Aaswad and Prakash, which sell the 'Brahmani' (less-spicy and from Pune) misals, do not work for her it seems. Well, the Sangli misal though was not just about heat I must admit. As one took some more bites of the dish, one began to discern tangy notes and sweet notes too and this made it seem more nuanced than the more uni-dimensional and spicy meat curries. If you thought that the food was all hot and spicy there then let me change that thought. I did cool myself down with some refreshing sol kadi and later a basundi (a sweetened rabrdi like drink) but before that I had a couple of brinjal based dishes that won my heart. There was a bharli vangi which was so different from the ones that one gets in restaurants. Here the dish was more about the the taste of the brinjal than that of the crushed peanut and coconut chutney. The gravy was light and the brinjal, Archana pointed out, was the seasonal green brinjal from the interiors which added a lot of flavour. Then there was the Maharashtrian version of the baigan bharta which we had with jowar bhaakris. Bhaakri, I learnt, refers to any type of flat bread and in Maharashtra, they use a variety of flour beyond just wheat. Rice for example. Jowar is another. Millets are becoming trendy today and Mr Byre Krishna Gowda, the agriculture minister from Karnataka's #LetsMillet campaign is helping to bring this super grain to the forefront. Well, its clear that Maharashtra can make a strong contribution to this movement too. The Maharashtrian baigan bharta/ smoked brinjal turned out to be very similar to the Bengali begun pora in as much as it had minimal spicing compared to the garam masala battered baigan bhartas that you get in Punjabi restaurants. There was no discernible taste of mustard oil though in this smoked brinjal dish here unlike in the Bengali begun pora. It reminded me a bit of the Arabian babaganoush too though that is less pulpy in texture than the Maharashtrian one. This dish that i had was all about showcasing the taste of the excellent quality seasonal brinjal used to make it. The stall that I had it from, added some toasted peanuts to the smoked brinjal dish, which added a lovely textural contrast to the brinjal. This dish is called vangi bharith. 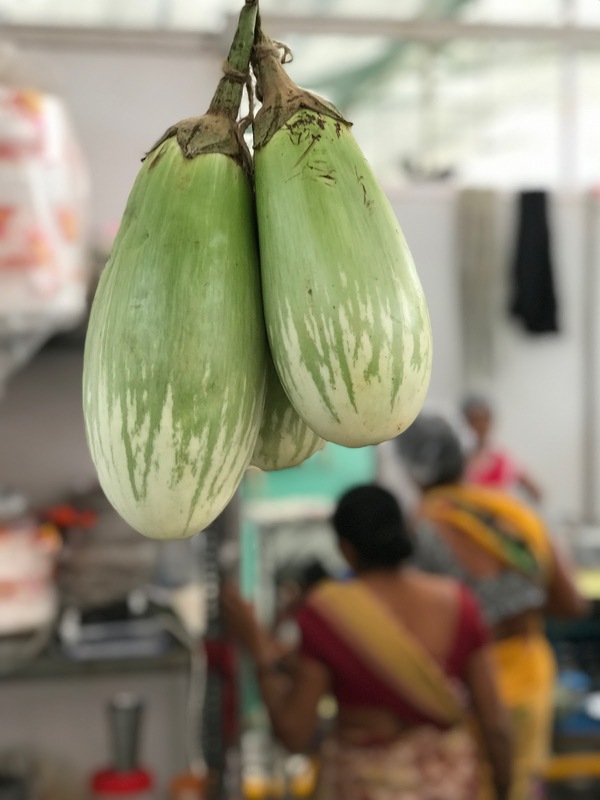 Vangi is brinjal/ eggplant/ aubergine/ baiga/ begun. Peanuts are often used in Maharashtrian kitchens. I am not much one for shopping these days including at food exhibitions or farmer's markets or while travelling abroad. You get most of what one needs in Bandra where I stay. At the most some good cheeses or cured meats are what I shop for when travelling. The Mahalaxmi Saras is different and unique when it comes to shopping options. There's produce from all over Maharashtra at unbelievable prices under one roof. Fresh kokum, various masalas (from the Ghati masala added to vada pav to chicken lollipop masala), different types of whole millets, a variety of rices including many types of the same such as the ambe mohor, Maharashtrian pickles (not the usual Rajashtani ones seen in fairs across India), including one made with the Mohua flour and mustard oil (which reminded me of Sunderbans in Bengal and the mohua flower toddy there), a million types of thechas, biscuits and then ladus made with millets and jaggery, bhakar vadis and jackfruit chips, health friendly stuff too including medicines from the dried roots of local asparagus. an assortment of flours made with rice, assorted pules and millets for making various type of bhakris and thali peeths at home, different types of sweets and then shops selling bags (from Haryana) for when you realise, like I did, that you have not come equipped to shop so much and buy a bag to carry the stuff home. It's not just about food stuff though that's what interests me of course. There were shops selling Warli paintings, saris and jewellery and bedsheets and carpets made from sheep skin and handicrafts and what not. It was not just Maharashtrian goods on offer either. There was the standard Kashmiri carpet stall and a stall from Himachal and one from north east and some selling paintings from Bengal and Odisha. Two of the most popular stalls were those selling cast iron vessels made in Haryana and claypot cookingware from Kerala. I both from both of these and some masalas and kokum too before I finally decided to head home. Most of these shops accept cash and possibly not cards and it's good to take money in small denominations as some of the stuff costs less than Rs 50. Hats off to the organisers of the Mahalaxmi Saras festival in terms of arrangements made. The tents are not air-conditioned but yet the high ceilings and good ventilation ensure that one didn't feel too hot even during the day. There's plenty of place to move around within the stalls. The eating areas are massive and there are lots of tables and chairs to sit and eat at with the staff coming and constantly cleaning up things but then I have always felt that the Maharashtrian community puts a premium on cleanliness or so visits to their restaurants seem to tell me. There's place to wash one's hands after eating too. carrying your own tissue papers and hand cleanser helps. There are toilets too though I didn't visit them and, on an unrelated note, an ATM. I went there by an Uber but found it difficult to book one while returning due to signal issues and got an auto. There are black and yellow cabs but they refuse to go anywhere or at least refused to take me to Bandra west though Sassy Fork got one to central Mumbai. There are share autos (Rs 30) to take you to Bandra east and Kurla Stations. The location of the grounds is roughly opposite where Trident BKC etc are at BKC and down a petrol pump. The fair is on till 29th January. Go, go, go!